Millennium Park is a famous gathering spot in the Chicago city. The place is well-known for its free concerts, public art installation. Jay Pritzker Pavilion is the main attraction of this place. The World’s greatest living architect Frank Gehry designed the artistic attraction that hosts Chicago’s massive outdoor festivals and concerts. Lurie Garden, Park Grill dining restaurant, pedestrian bridges, Art Institute and Maggie Daley Park are the most entertaining spots here. Millennium Park is Chicago’s leading green space that occupied 25 acres of landscape, fine architecture with a collection of public art. 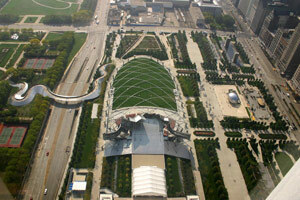 In 2014 Millennium Park celebrated its 10th anniversary. It continuously hosted and made the visitors to enjoy dozens of programs. Free events such as outdoor concerts, art installations, alfresco workouts and films screenings are popular here. Cloud Gate is a massive, stainless steel structure that has renowned as Chicago’s landmark. Many tourists and visitors take photos in front of the Cloud gate. 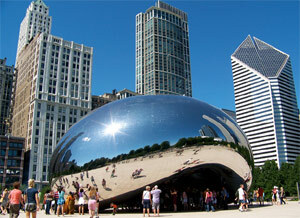 As Millennium Park Chicago bean owns the bean shape, Cloud gate is otherwise called as “The Bean”. Its mirror-like surface reflects the entire downtown skyline. Winter months are good to skate here amid the twinkling tree lights in the place of McCormick Tribune Ice Rink, a dedicated skating place in here. Warmer months have grand celebration with live performance in front of the Pritzker Pavilion. The Millennium Park Summer Concert crew makes the tourists and visitors enjoy with world music rock, jazz in free admission. Chicago Blues Festival, Grant Park Music Festival, and the Chicago Jazz Festival are the annual events in the venue. The tourists can take a cool breath here in Crown Fountain’s pool. Alfresco patio Park Grill is the satiating place for food and drinks. Great Lawn makes the people to walk out on their rest days.